Rugby union - Old Crocs v Northern at Broomfield. 'James Wainwright for Crocs. Old Crossleyans had to overcome adversity to gain a hard-fought 26-21 home win over fellow Yorkshire One slow starters West Park Leeds at Broomfield yesterday. With the club’s three number nines all missing, James Wainwright showed his versatility by slotted in at scrum half, while James Cooper and Raman Sembi formed a second row rather lacking in size. The visitors dominated the early stages before Crocs finally broke out, skipper Jack Hammond beating numerous visiting players and Kasey Pearson charging past several more before getting injured in the tackle. The big No 8 could be out for four weeks with a hamstring injury. Undeterred, Crocs took a 6-0 lead with penalties from Ryan Sweeney on 11 and 15 minutes, the second after a great run by flanker Matthew Schofield. 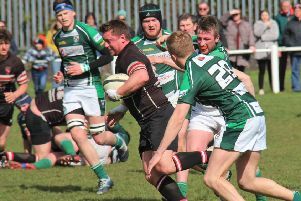 The home side lost Rob Oliver to the sin-bin and West Park, realising Crocs were a couple of forwards down, opted for a scrum from the penalty and surged over the try line with No 8 John Fletcher’s try converted by Andy Cromack. Crocs soon turned a 7-6 deficit into a 13-7 lead, Hammond scoring under the posts following Gareth Ott’s kick ahead and Sweeney converting on 26 minutes. Another Sweeney penalty was followed by a try from close range by captain for the day Reuben Pollard, the goal giving Crocs a commanding 23-7 lead. However, West Park got a lift in added time at the end of the half when Dom O’Connor intercepted and raced 80 metres unopposed to score a converted try. A West Park penalty was followed by a lineout and scrum and the visitors rumbled to the line for prop Sam Stewart to cross, Cromack adding a fine conversion to make it 23-21. Both sides were tiring. Sweeney was successful with what looked an ambitious penalty attempt and although he missed another, Crocs were satisfied with their second win of the season.